--Are you tired of being overlooked at the airport? --Want to spend a couple extra hours building relationships with the airport security guards? --Do you feel like consistently missing your flight? 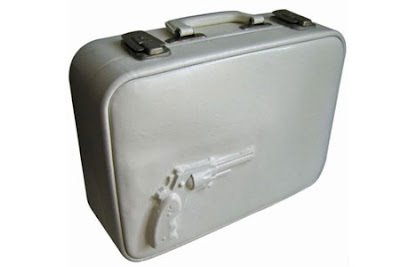 Then here is the product for you-- a suitcase embossed with the imprint of a gun. Yup. They really exist and are for sale at kidslovedesign.com. For just under $200 you can have one of these cases which were designed to be an expression of dark humor. These are sold on a site that specializes in designer kids products, but they are purchased by adults. One security expert says that these are sure to get the attention you'd expect.